The vale of Kashmir is set in the lap of the famous Himalayas, towering to 18500 feet, with the sinuous Jhelum river cutting across in coils and curves forming the highway and tha main source of sustenance. This fertile land has over centuries enticed people from all over the world to behold its legandary beauty. A bounding in charm and splendor, the Valley of Kashmir is an ultimate destination where travelers visit to discover a dream. In the past, Great Mughals and the British resided in Kashmir to escape the scorching heat of the plains. With the growing short holidaying culture among tourists, the Valley is an ideal destination to spend 5 to 15 days. Staying over a month has been the choice of foreign visitors who trek where no one stands between the glory of nature and mankind. Perched at am average height of 1515 meters above sea level, this northernmost area of the of the Indian subcontinent is separated from the plains by the Pirpanjal Range and surrounded by Karakoram Range on the north. Mesmerizing fresh air, towering mountains, lush green meadows, mystical blue-green lakes, exquisite food and handicrafts, countless flora & fauna and Kashmir�s enchanting four season offer true colors of Earth. 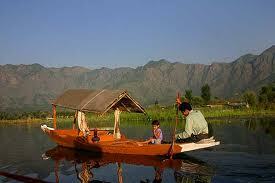 People of Kashmir speak �Kashmiri� with a slight variation in the dialect in various districts of the Valley. In distant and peripheral areas �Gojri� is spoken by Gujjars or nomads. Urdu is widely understood and spoken in most parts of the Valley. English too is not unknown, particularly at tourist destinations. Large round silver ornaments known as �Tumar� worn by womenfolk and turbans worn by men have been part of the traditional attire of people in the Valley. Generally of friendly nature, Kashmiris are hard working and hospitable which has been the real force behind epitomizing Kashmir as paradise. Kalhana�s �Rajtarangini� written in the 11th century is the earliest record available in the history of Kashmir. According to Kalhana, Gonanda I came to the throne of Kashmir about 2448BC. His descendants ruled for many centuries. King Ashoka conquered Kashmir in 250BC and made Srinagar the capital if his emp0ire. 1st century AD saw the arrival of Kushan dynasty. Emperor Kanishka organized the 3rd great council of Buddhist at Harwan. From the Karakota dynasty, the great ruler Lalitaditya Muktapida is mentioned as ruler in 8th century. The 9th century witnessed the rule of Utpal dynasty that produced the great ruler Avanti Verman during whose reign Avantipur was the capital. In the 10th century, the Lohara dynasty ruled in Kashmir. 11th century saw the rule of King Harsha, a poet and lover of art & music. 12th century witnessed the rule of King Jaisimha. In the 13th century, Kashmir witnessed upheavals, mutual quarrels and civil wars that weakened the Hindu rule.